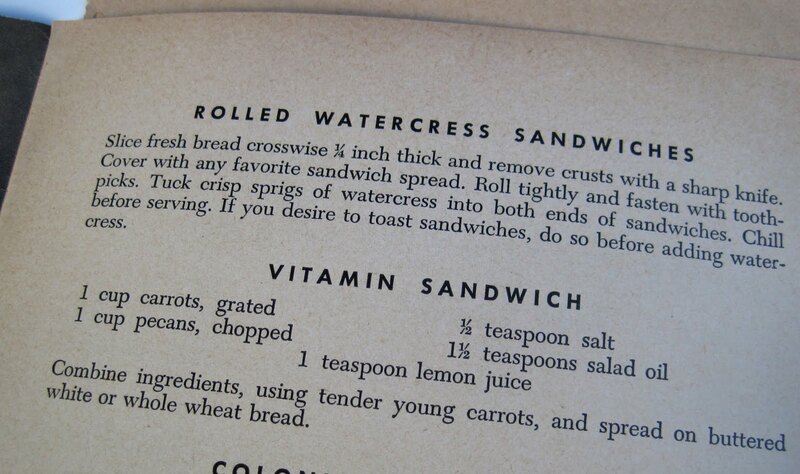 Earlier this year I spotted a recipe for something called Vitamin Sandwiches in this 1942 booklet. Now I must admit, the name is not very appealing. But why? Vitamins are good for us, right? So why did I assume Vitamin Sandwiches wouldn't taste very good? 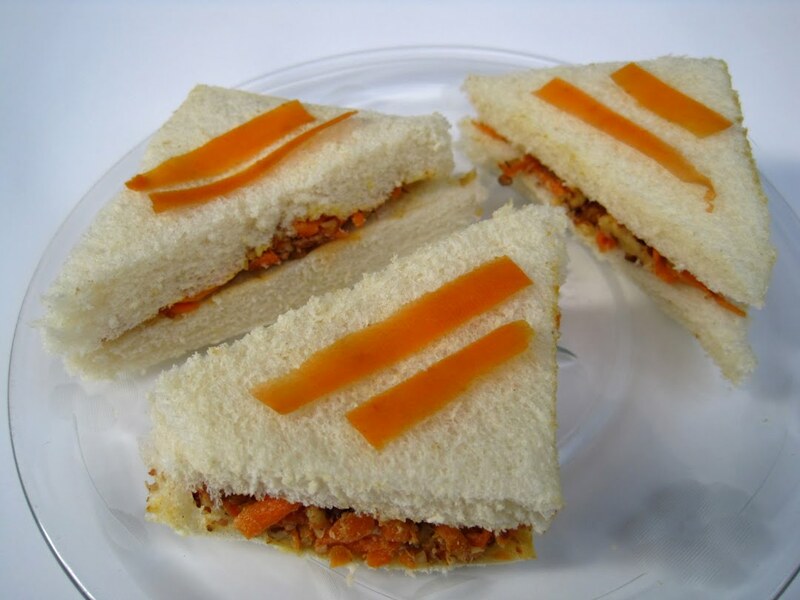 I had such low expectations, it was a pleasant surprise to find this was a simple, tasty tea sandwich that packs a lot of crunch and which would be a very fine addition to a tray of tea sandwiches. The texture alone makes this something worth considering, if only to balance out all that cream cheese we inevitably serve at tea! This is the recipe as shown in the booklet, but I'm typing it below, too, just in case you have trouble seeing it. Combine ingredients, using tender young carrots, and spread on buttered white or whole wheat bread. Note: I added a few drops more of vegetable oil to help bind everything together and skipped buttering the bread. Not much oil, though, because this didn't taste oily at all and I didn't want it to! Also, I used a vegetable peeler to slice some thin strips of carrot to garnish these sandwiches. 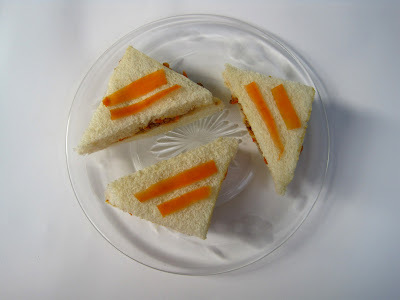 All those white bread sandwiches tend to look alike, so if possible I like to do something decorative and ideally something offering a hint of what's inside the sandwich. 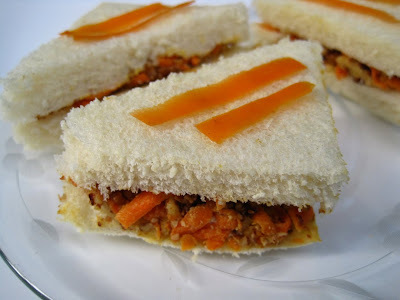 Oh, and if I do serve these at tea one day, I'll upgrade the name to Carrot-Pecan Sandwiches! It's been quite some time since I last bought Red Rose Tea, and I was surprised to see they are still offering the Calendar Series of figurines. It's always so fun to open the box and see which one I've received. 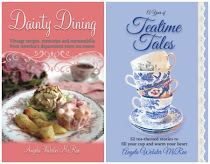 Kind of like Cracker Jack prizes for tea lovers! Yay! 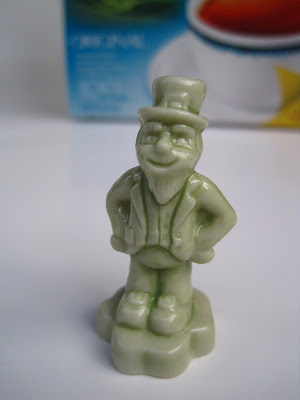 I got the March figurine, which I did not already have. I like this little guy! Are any of you still collecting Wade Whimsies? If you're not familiar with them, go here to learn about these great little freebies. Soup that's pretty enough for teatime! 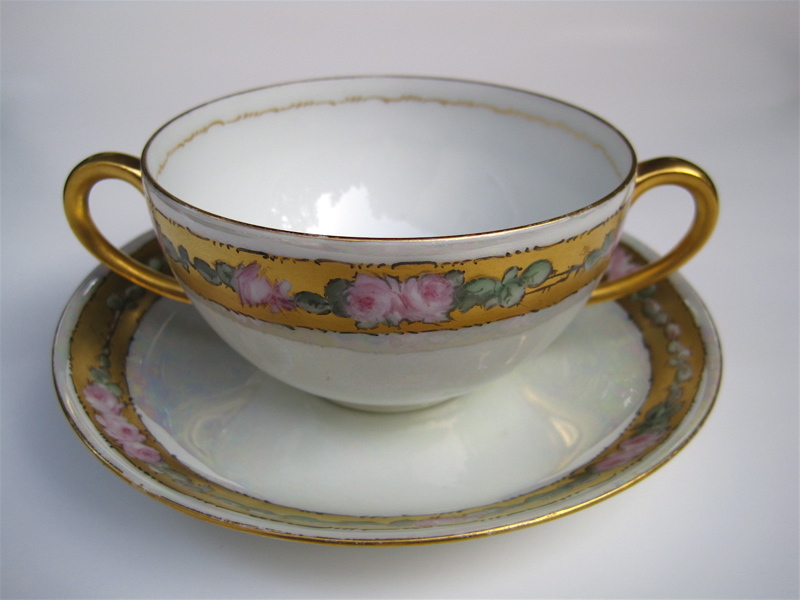 Have you ever served soup at one of your teas? I haven't, and it's not that I haven't thought about it. It's just that I haven't yet acquired enough dainty, two-handled cream soup bowls. I found a lovely one last year at one of my favorite local shops, What's in Store, and recently I found an equally pretty design at the same shop. It prompted me to try making this chilled Creamy Cucumber Soup, and I love the soup *almost* as much as the soup bowl and saucer. 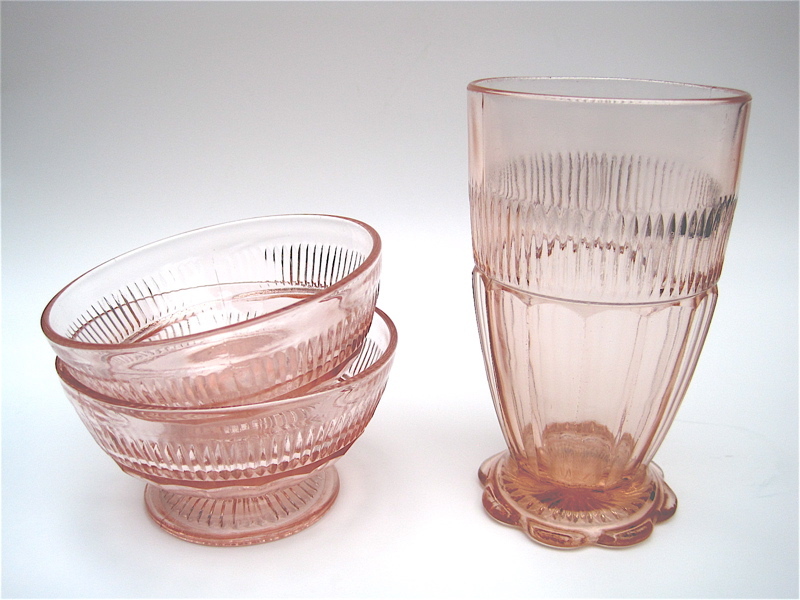 Sometimes I think I might like to have lived back when they had fancy serving pieces and silverware for every food. 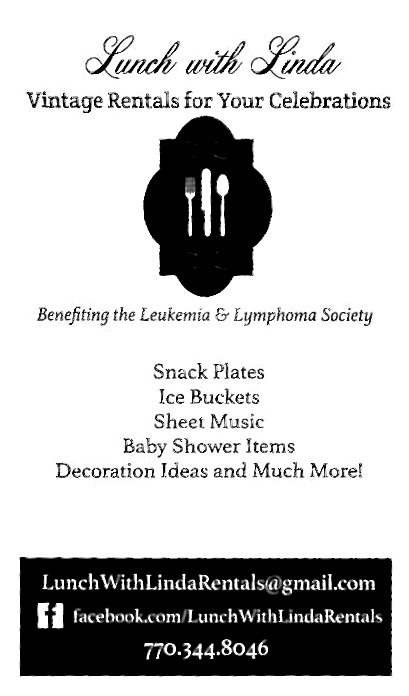 Then I remember that I occasionally like things like paper plates and dishwashers. 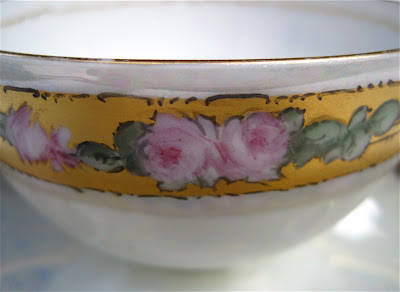 Aren't the roses on this piece just so yummy! 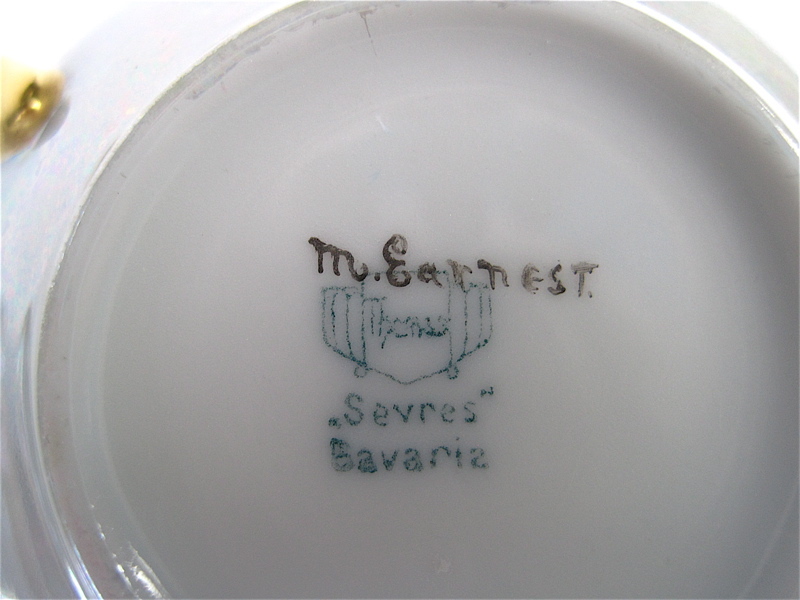 For any of you backstamp detectives, does that say "Thomas" above the words "Sevres" and "Bavaria"? And what about the M. Earnest? The person who painted the piece, perhaps? 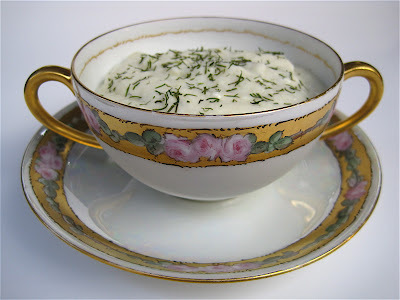 At any rate, I needed to use up some cucumbers this week, and when I found a super easy recipe for Creamy Cucumber Soup there was no question what I'd serve it in. 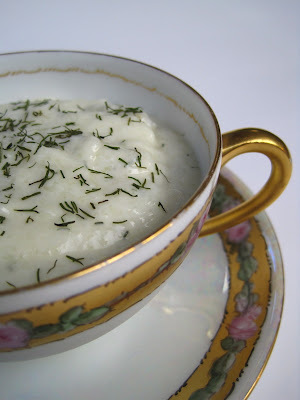 Here's my recipe, in case you have a hankering for some cucumber soup yourself! Place cucumbers in food processor and pulse until liquified. 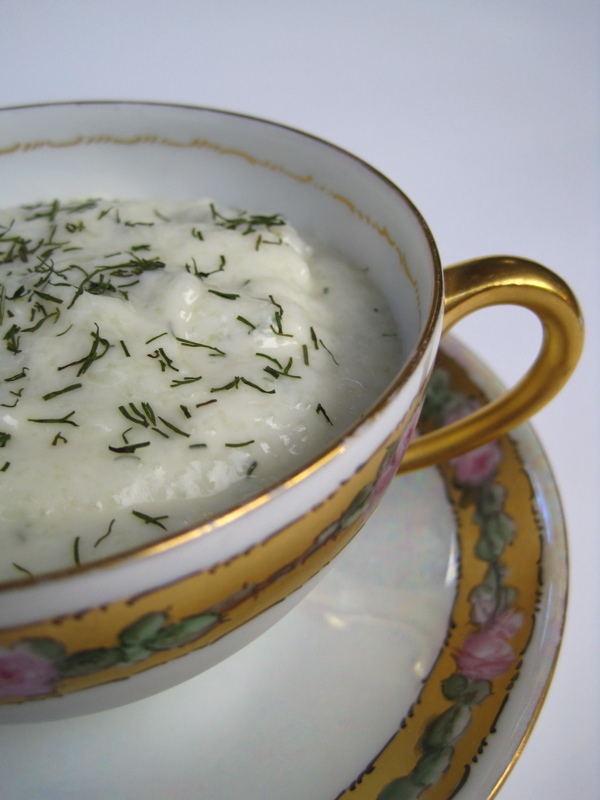 Pour into large bowl and add soup and sour cream, stirring well with a wire whisk. I wanted to try the soup with two different flavors, so I divided the soup among two bowls. To one, I added the curry, and to the other I added the dill. I liked them equally well, but I thought the dill made for a prettier photo! As many times as I've seen these over the years, I don't guess I'd ever tried using these muslin tea bags to make iced tea during the summer. 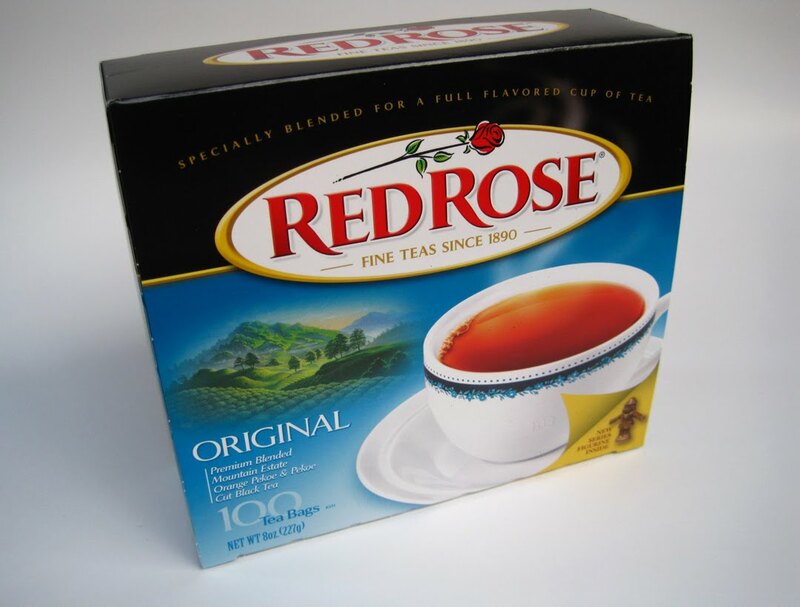 When I saw these at a World Market over the weekend ($3.99 for a pack of 4), it dawned on me I could save some time I've spent straining off tea leaves in recent weeks. I folded down the top of the bag, and it was easy to add 4 or 5 tablespoons of loose tea. 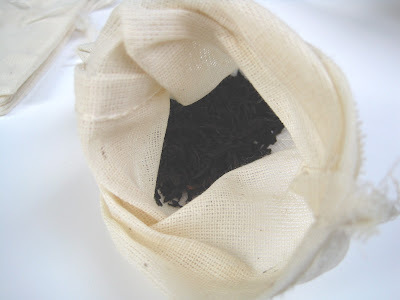 A drawstring closes the bag to keep the tea leaves all nice and tidy but still allowing some room for them to "swim." 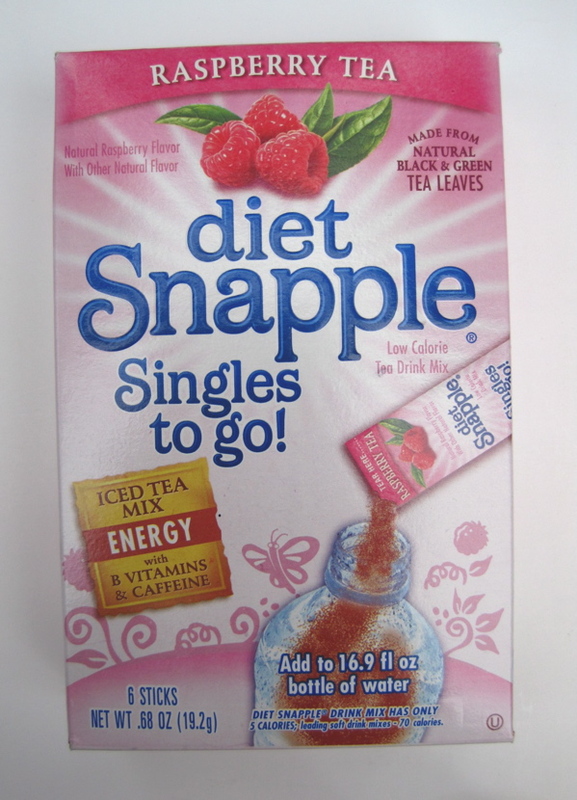 I almost always steep iced tea in the fridge now. I put these tea leaves in when I left for work, and by the time I got home my tea was ready. 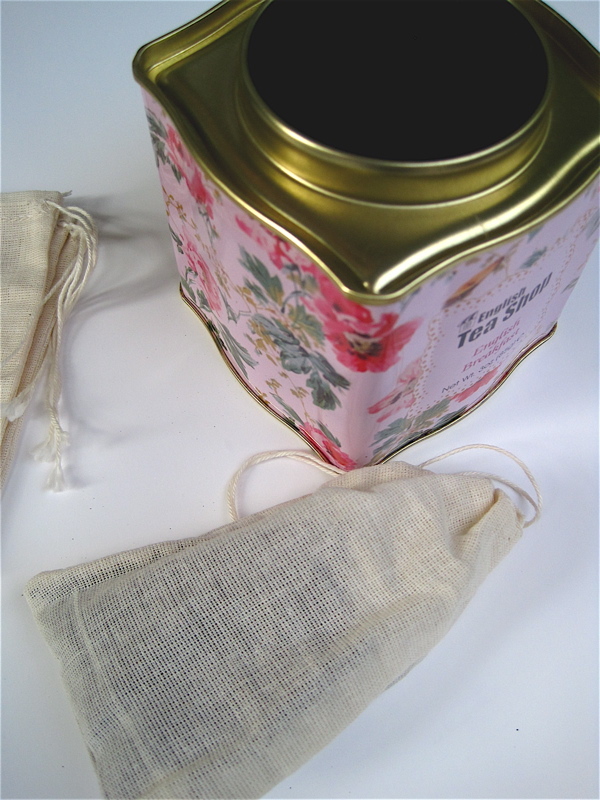 I think I'm going to like these do-it-yourself tea bags! The new issue of Martha Stewart Living has a recipe for Tea-Scented Melon, a mixture of summer fruits infused with tea, honey and mint. I liked the idea but not the particular ingredients in the recipe. 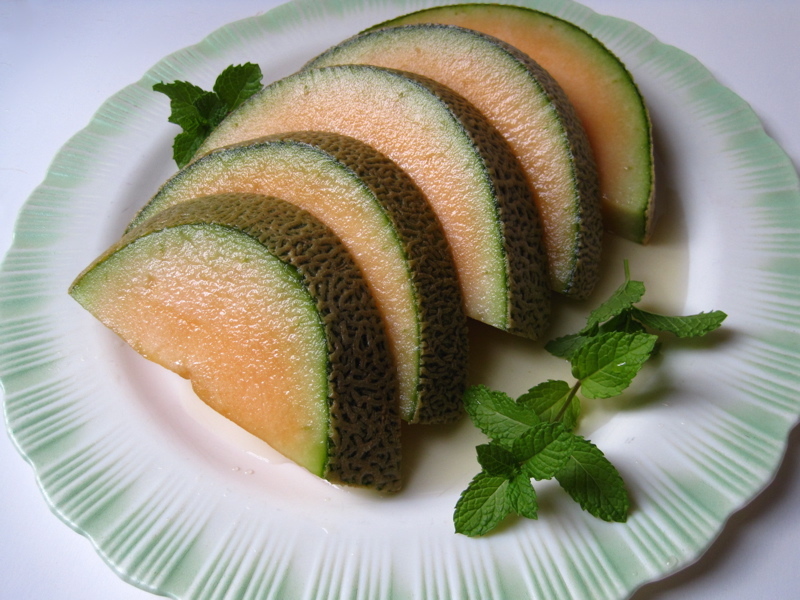 So I made up my own concoction to go over cantaloupe and oh my goodness, is this ever a wonderful new use for tea! First, I got a package of pre-sliced cantaloupe at the grocery store. The package I got was a pound and a half, but I don't think this "recipe" has to be very exact. 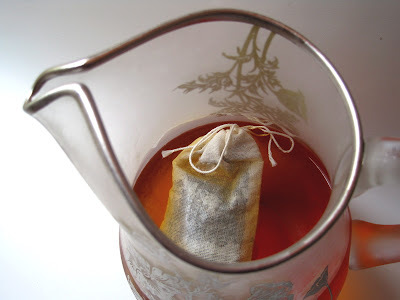 I brewed about two cups of hot tea using two Ginger Peach teabags, to which I added a tablespoon of honey. I placed the cantaloupe in a large bowl. 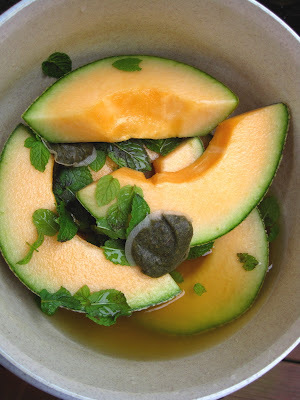 After the tea had steeped for several minutes and cooled a bit, I poured the tea over the cantaloupe and added a handful of fresh mint leaves before putting the bowl in the refrigerator to chill for a couple of hours. 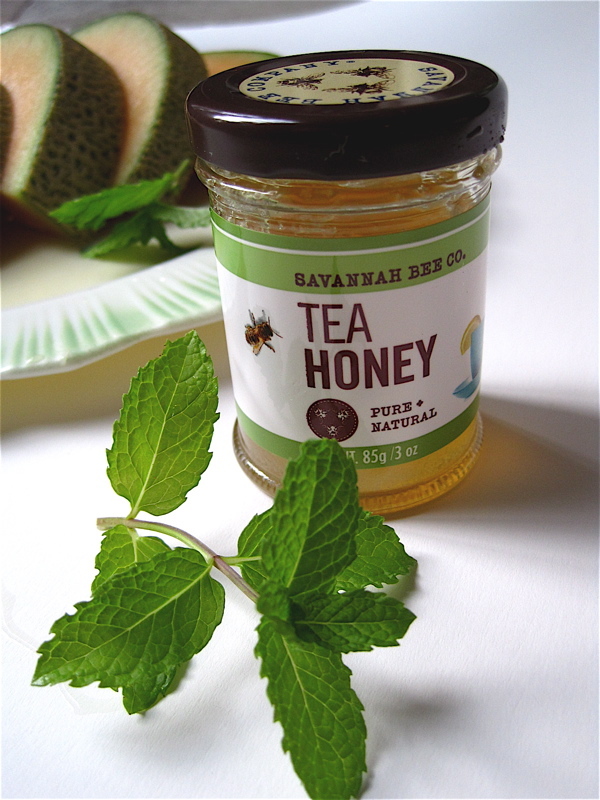 The honey (Tea Honey from a friend) and mint, combined with the spicy taste of the Ginger Peach tea, really turn simple cantaloupe slices into something special. My husband liked it too, and I would not hesitate to serve this to friends as a simple summer dessert! Amber S.! 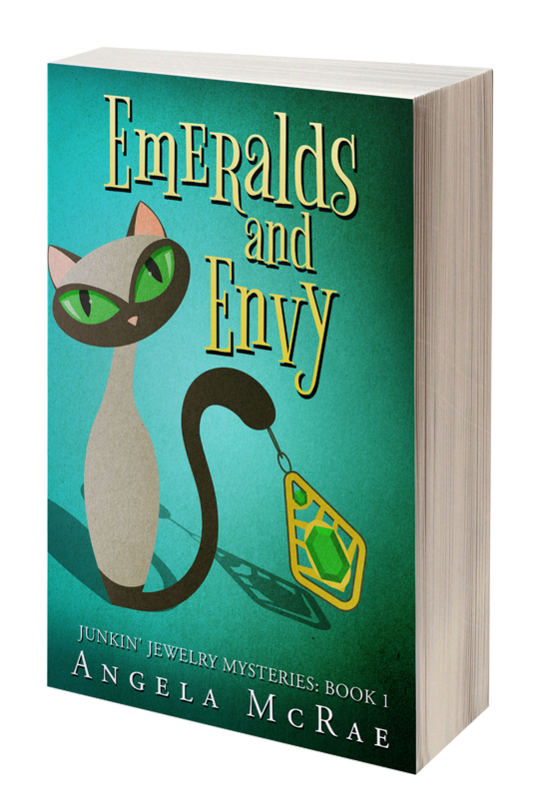 If you'll send me your snail mail address via the e-mail button at right, I'll get these in the mail to you. Congrats! 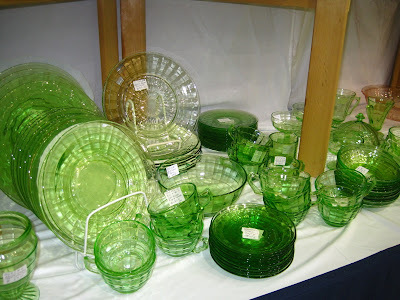 Well, I'm happy to report that the Peach State Depression Glass Show was certainly worth a visit this weekend! The Cobb County Civic Center was packed with some truly beautiful glassware, and you can read books on glassware all day long but there's nothing quite like looking and touching! Surprisingly, the greens and blues caught my eye more than the pink glassware. This Block Optic pattern always gets my attention because some pieces resemble the angular design of the Tea Room pattern I'm always after. 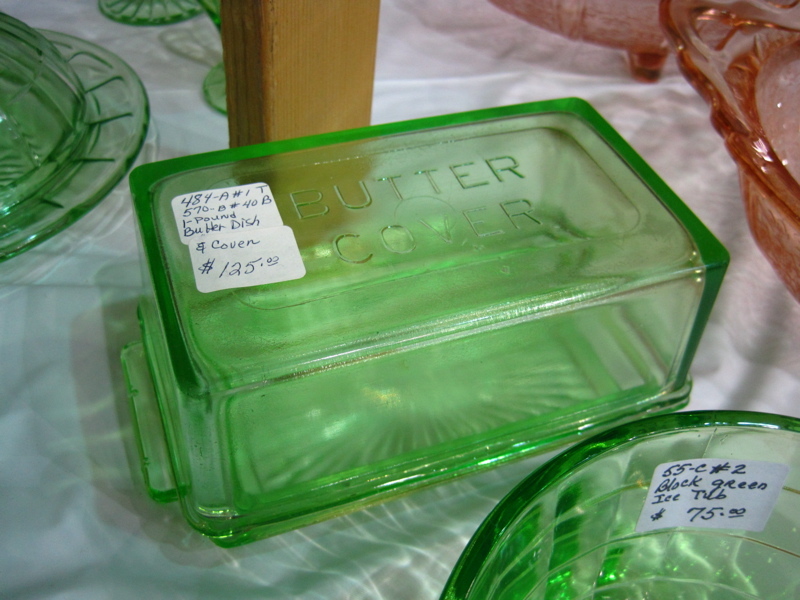 I also enjoy coming across pieces I've never seen before, like this dish and Butter Cover. 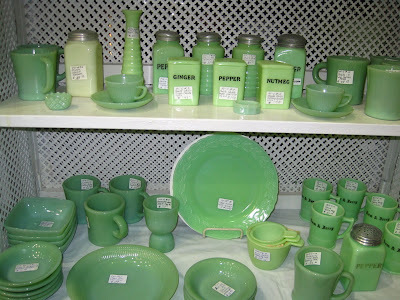 Do any of you collect Jadeite? I don't (yet), but I've long admired it. 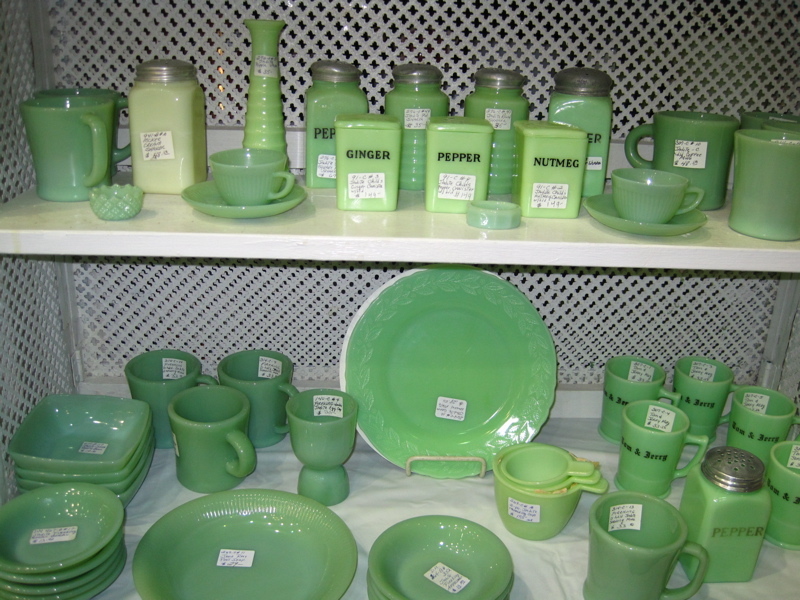 A few vendors had gorgeous Jadeite tea canisters, but they started at about $135 so I'll just have to wait for my mom to find one for me at a yard sale! 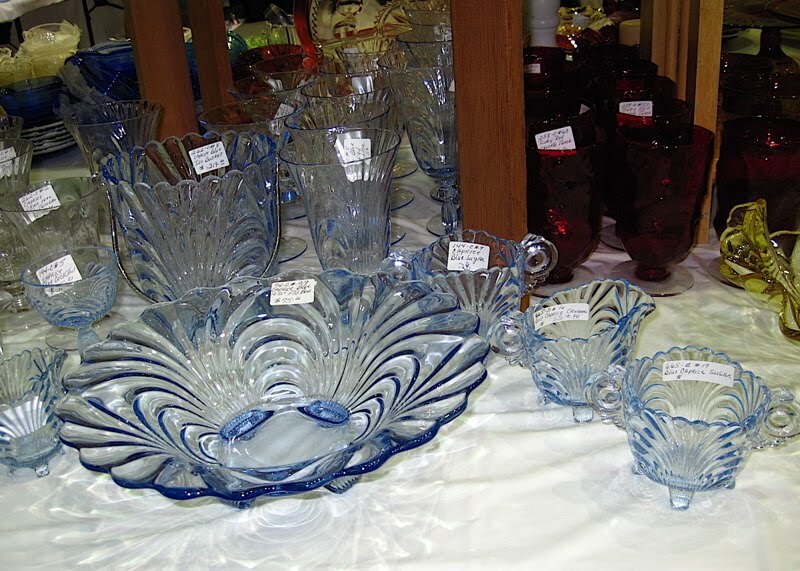 Most antique malls I visit seem to have far more glasses and bowls and plates and not a great selection of teacups and saucers. Here, every table had teacups galore! I'd seen this Swirl pattern in glassware books and was never that impressed, but "live" it is really a beautiful color called "Ultramarine." And to think, these were once dime store dishes! The pattern that most impressed me, though, was this beautiful icy blue Caprice. 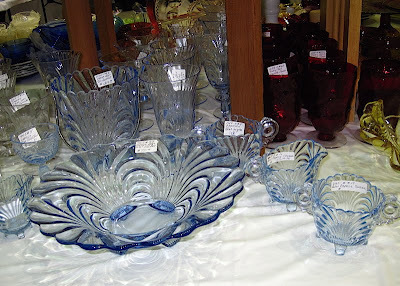 I've never decorated with this shade of blue, but if you do ... find you a piece of this glassware! It is simply stunning! 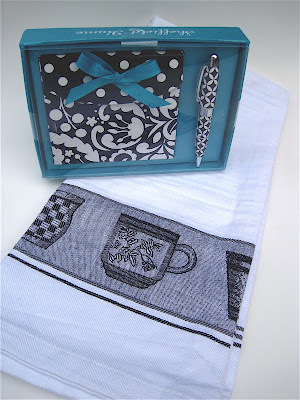 Here's a sugar and creamer in Caprice. 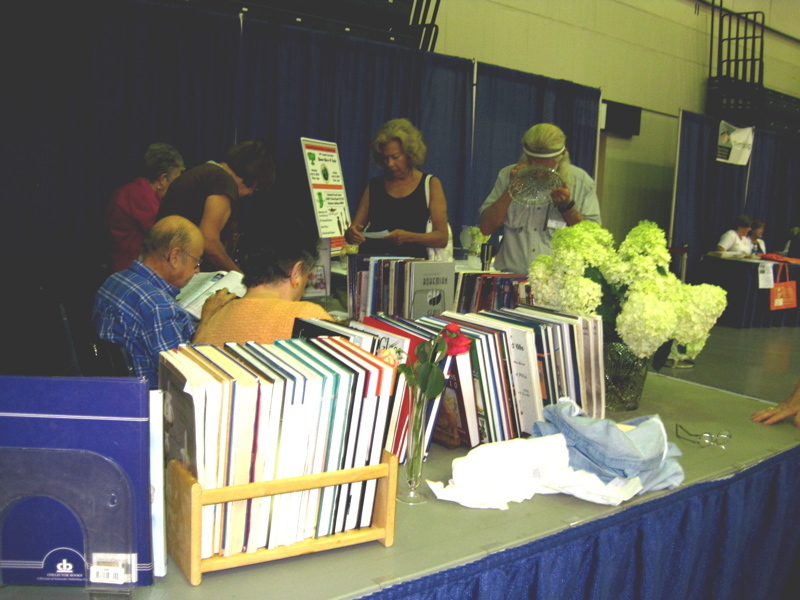 After I'd visited quite a few booths, I was horrified to discover many of them had glassware on the floor and I hadn't been paying attention! Yikes! 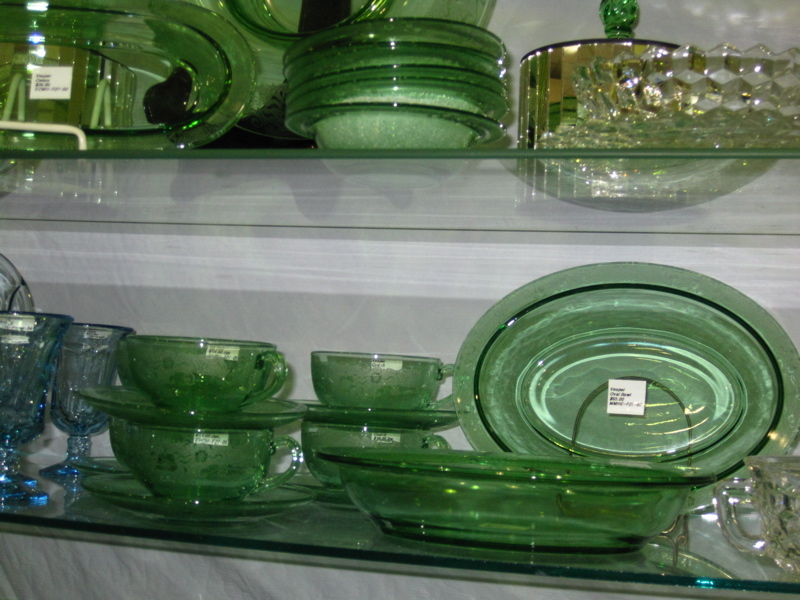 The green glassware I've seen tends to be a light lime green color, but this glass was a pretty light olive green. Very unique. 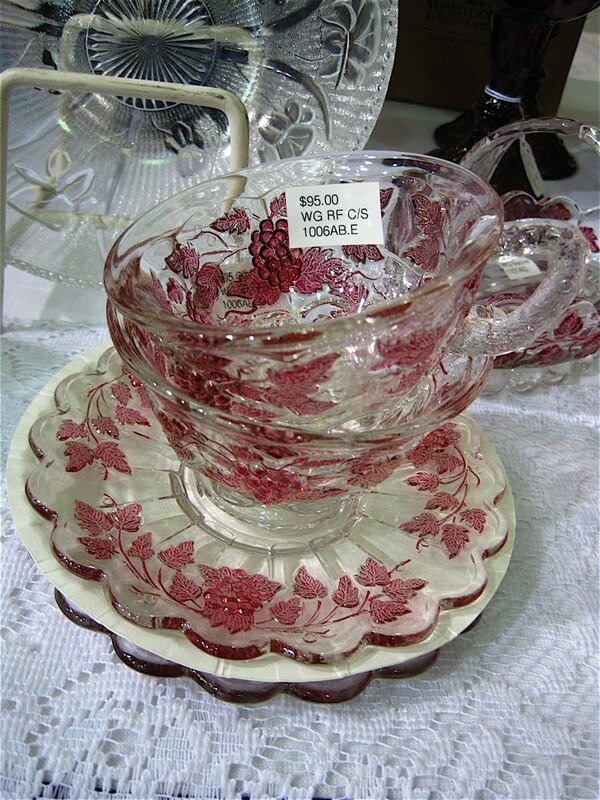 Also unique: this cup and saucer with grapes on it. LOVE the shape of that saucer! At $95 these were some of the pricier teacups I saw (and surely rare! 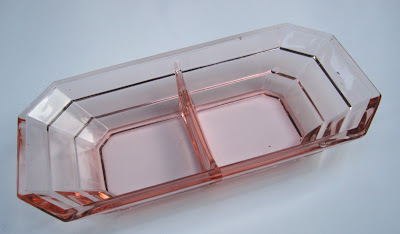 ), but there was lots of glassware for under $10 too, so it was nice to see they have pieces for all pocketbooks. If I ever see some of these glasses ($58-$85) at a yard sale or flea market, I'll know they are worth a pretty penny! 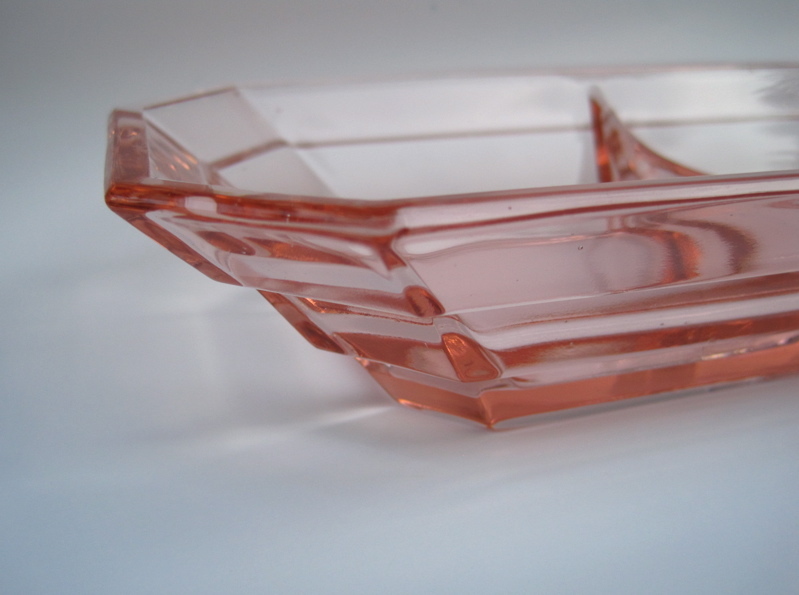 My purchase of the day was a divided relish dish in the pink Tea Room pattern, easy to spot because of the angles. It took some restraint, but I bought only this one piece. 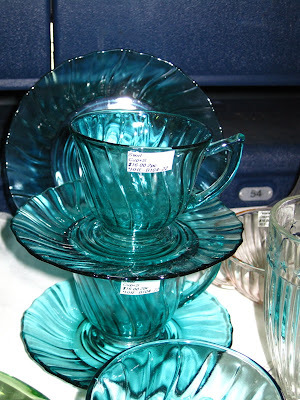 (The $355 pair of Tea Room glass lamps did not come home with me, alas.) 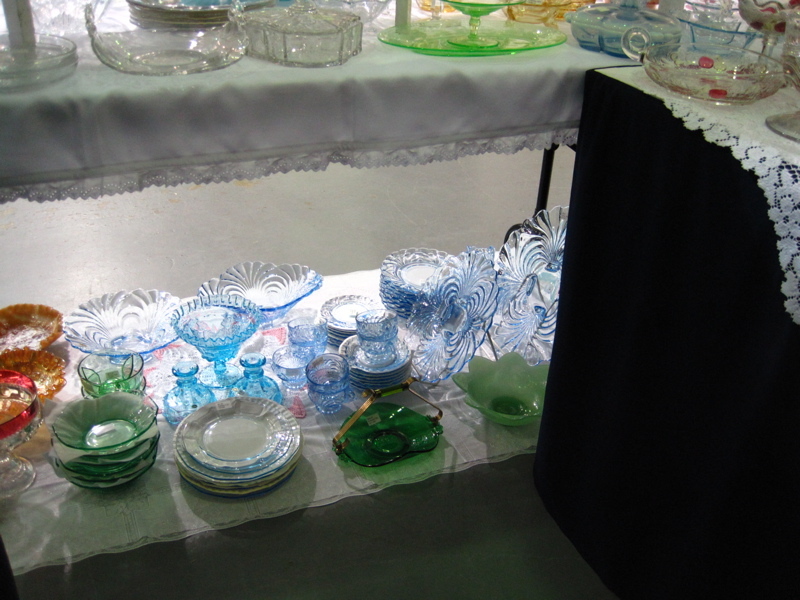 Compared to other patterns with lots of pieces on display, there really wasn't a lot of Tea Room glass. 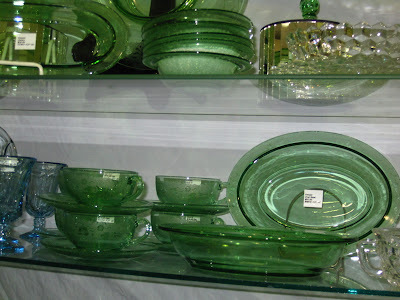 A sugar bowl in pink, a creamer in green, another relish dish like mine (in green), one bowl, a few plates, two ice buckets and a clear goblet. Oh, and lest I forget -- a banana split dish that tea rooms must have used for very small banana splits! 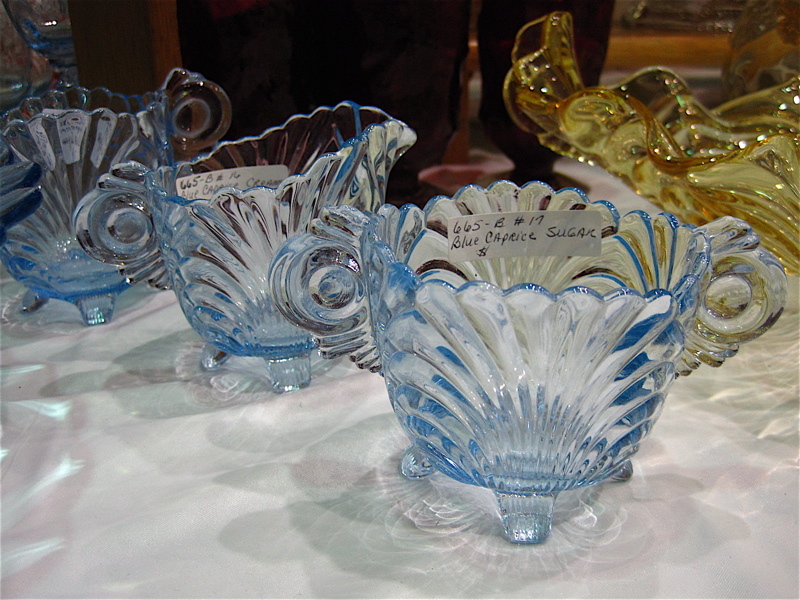 It was fun to see so much glass in one location, and I feel like my "glassware education" got a boost at this show! 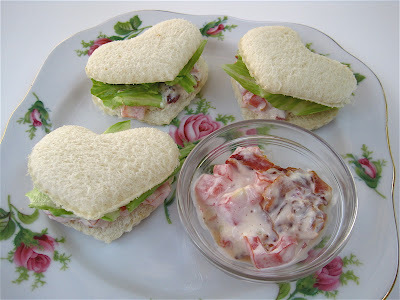 We've had tomatoes at my house for weeks now, and though I've enjoyed slices as part of a vegetable plate many times, I didn't have a good old-fashioned Bacon, Lettuce and Tomato Sandwich until a few nights ago. This really is one of the world's most perfect foods, isn't it? I always head to the store for a loaf of good old bad-for-you white bread (I like Sunbeam), to which I add mayonnaise, thick slices of tomato, salt and pepper, hot strips of bacon and crisp pieces of lettuce. Then I cut the sandwich in half (diagonally makes it taste better, in my opinion), and if you're lucky you'll soon have a little tomato juice dribbling down the front of your shirt. Mmm, mmm, mmm! 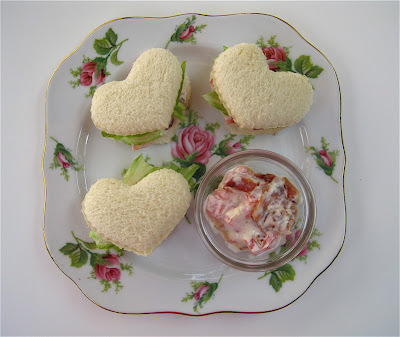 And did you know you can make BLT tea sandwiches? Several years ago I read about combining the mayonnaise and bacon to make B-L-Tea sandwiches, and I wrote about those here. This week, I decided to go a step further and mix everything but the lettuce, because that would just be ugly. 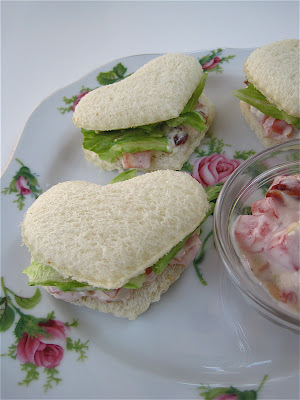 Since I "love" these sandwiches so much I used a small heart-shaped cookie cutter, then added my filling and small pieces of lettuce. And there you have it, the perfect summertime tea sandwich! In small bowl add tomato, bacon and just enough mayonnaise to lightly combine. Add seasonings as desired. Spread on bottom half of sandwich and top with just enough lettuce to peek out from under your top slice of bread. Savor and sigh! Many of the giveaways I've done through the years have been items that were pink or featured roses, but today I'm doing something a little different and having a giveaway in a color palette we don't see all the time here in tea world! 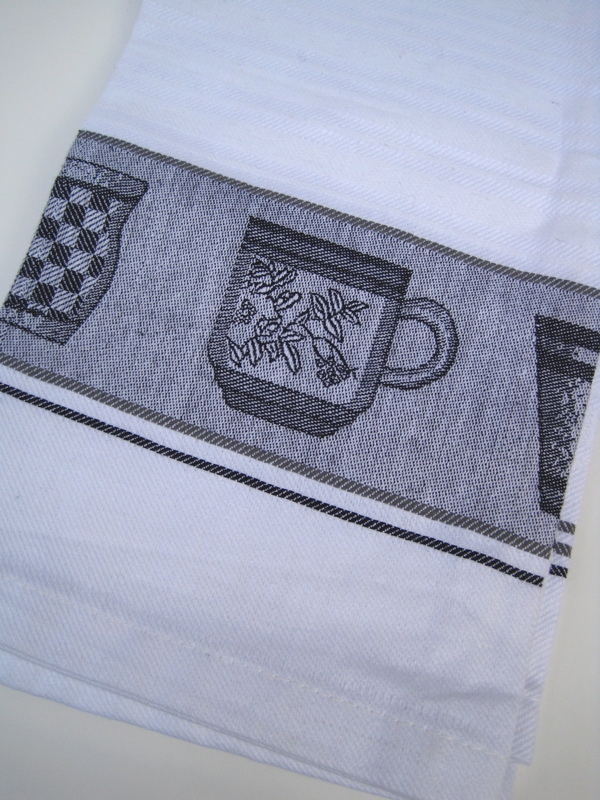 While I don't have a black and white kitchen, when I saw this set of two black and white tea towels on clearance the other day I knew these needed to be in the home of a tea lover. Yours, perhaps? 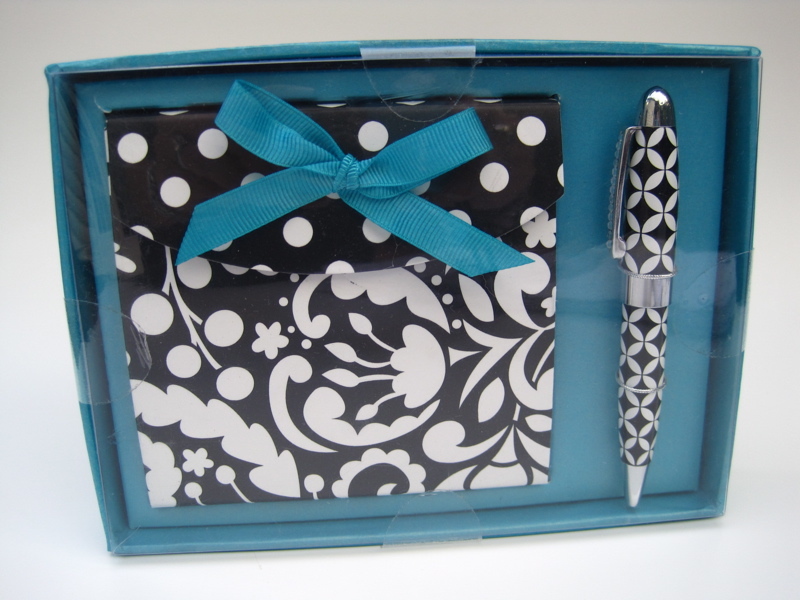 And to continue with the theme, I'm offering this little notepad and pen set. 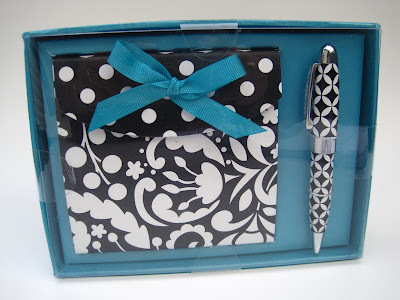 While I don't decorate with black and white, I do love that color combination and have worn a lot of black and white over the years. If you'd like to win these goodies, just leave a comment between now and 7 a.m. EST Monday and they could be yours! Good luck! Well, no, I didn't exactly *need* a new oversized tea mug, but this one caught my eye at T.J. Maxx the other day and I realized that for $3.99, this would make a dandy pen and pencil holder! This is, I believe, the first tea mug I've ever come across that featured a paper band around the middle telling me it's a Giant Retro Tea Mug. 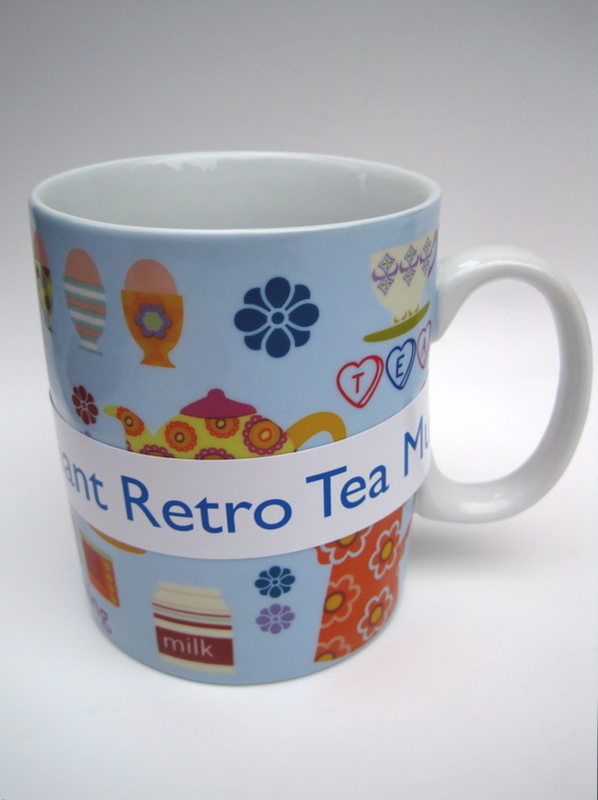 The bottom of the mug is marked Retro Tea, Creative Tops Ltd. The band indicates it was made in China but designed/marketed in Great Britain. 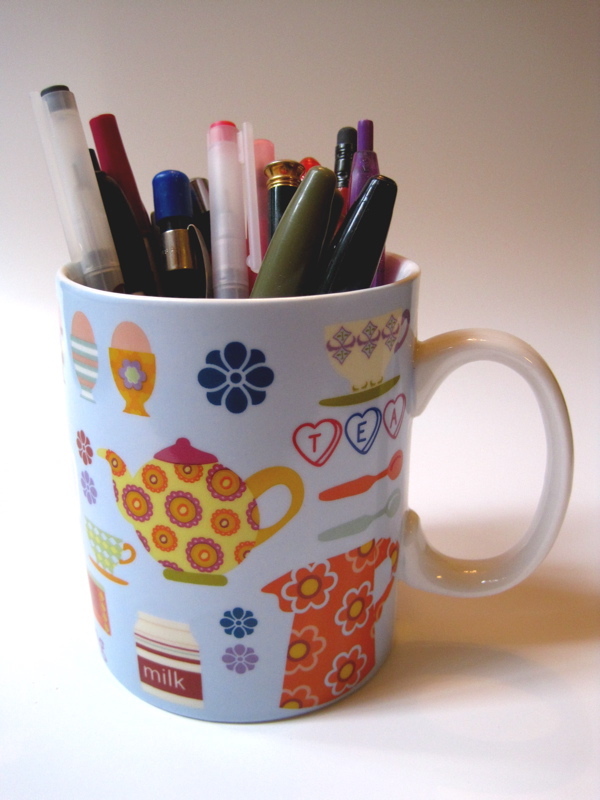 I just love the cheery graphics on this mug, and I truly am going to use this as an office supply. 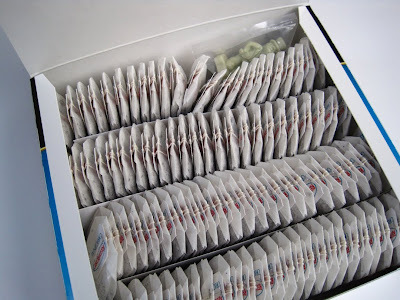 Teawares: they're not just for breakfast anymore! 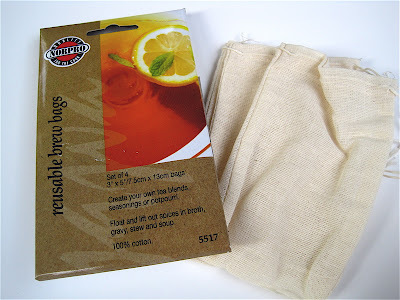 Whether it's the dollar bins at Michaels or Target or the ones at Dollar Tree, I so enjoy the bargain possibilities of a good dollar store visit! 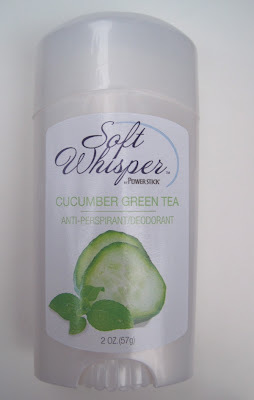 A recent trip to Dollar Tree yielded some cucumber and green tea anti-perspirant, a fine knockoff of a popular name brand version. 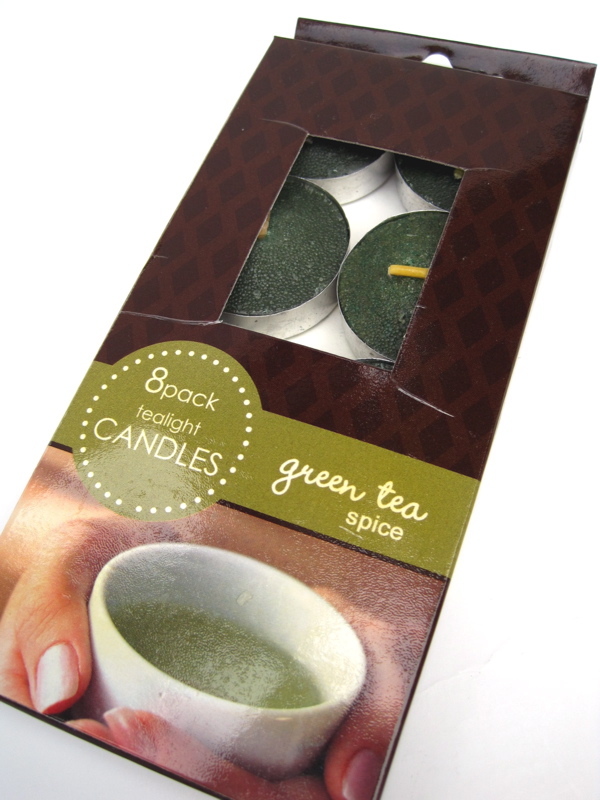 I can always use a spare package of tealight candles, and these are a good color and smell nice to boot. I like to keep these powdered tea mixes handy during the summer, but I'd never thought of looking for them in the dollar store until I spotted these at Dollar Tree. 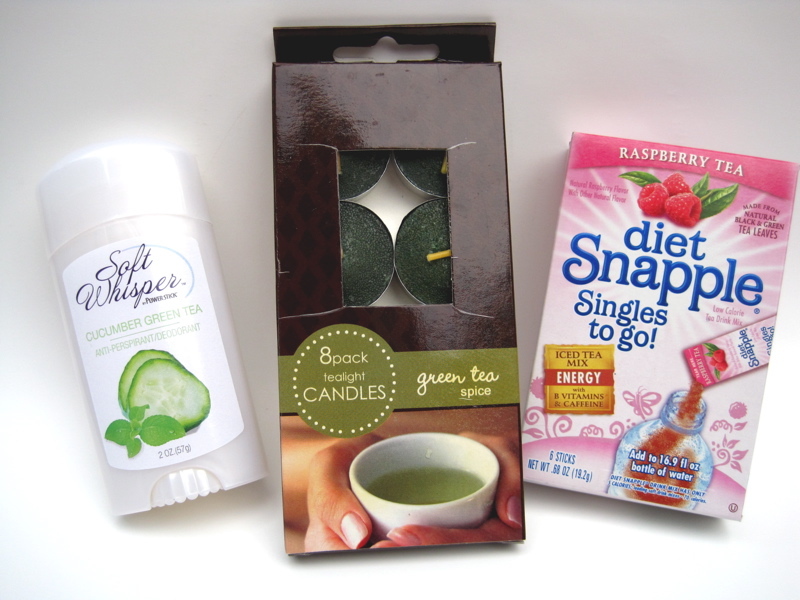 Are you a dollar store shopper? 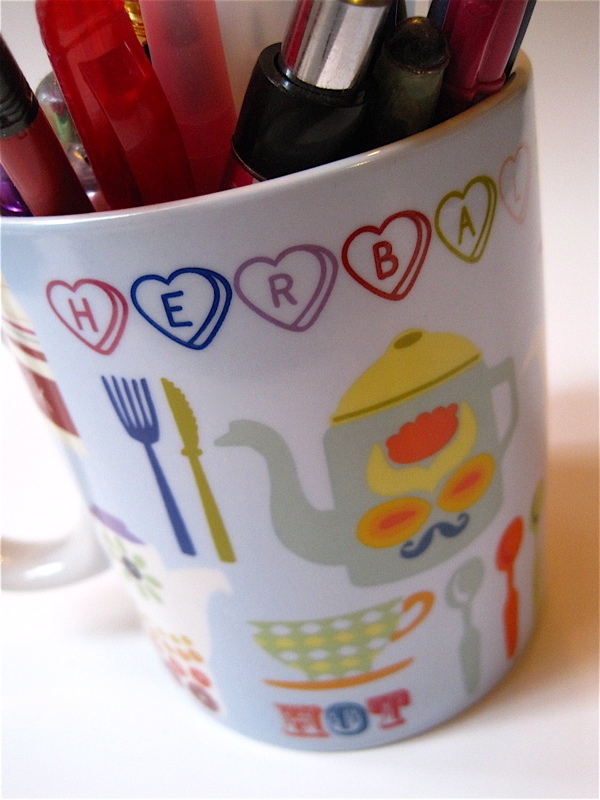 If so, have you ever found any tea-related items there? Last year while on a trip to Mobile, I came across the two small sherbets at left for just a few dollars each. 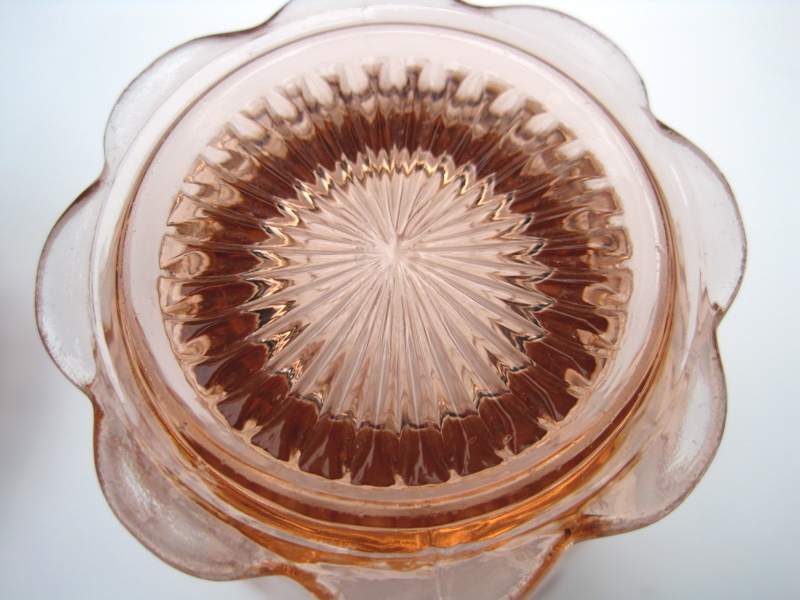 I later learned they are in the Coronation Depression Glass pattern. 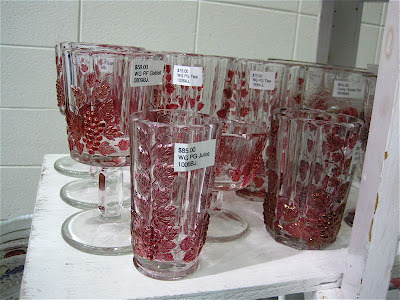 Recently, I was again antiquing in Alabama when I came across a matching tumbler. 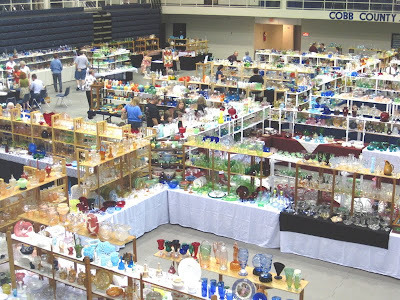 I'm thinking about Depression Glass this week because here in Georgia, a Depression Glass show is coming up at the Cobb Civic Center and I'm planning to go! 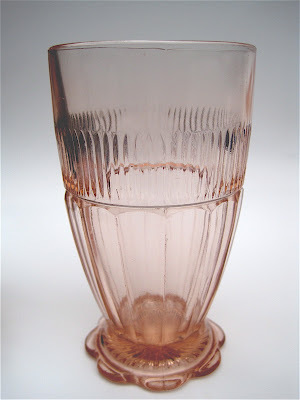 This tumbler is such a pretty piece, and I love the scalloped base. I guess I got the collecting bug early by going along with my mom as she collected Depression Glass when I was a young girl. If only I had been a serious collector back then! I always loved looking at old stuff, and to this day I enjoy that "musty" smell of old books and furnishings. 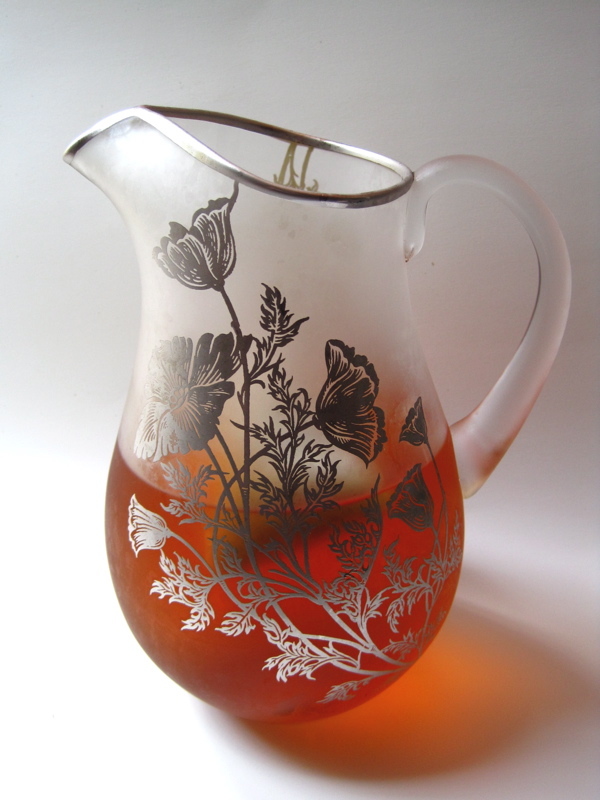 But if I had focused my collecting interests earlier in life, just imagine the fine collection of glassware and teacups I could have started back before everyone learned the value of these things! The other reason I like this glass is that it has a pretty sunburst design on the bottom. I can't remember where I saw it, but I found an article or blog post that showed how a patterned glass was used to create an impression onto circles of sugar cookie dough. I made a mental note to look for a glass with a pretty design on the bottom, and this certainly fit the bill! And now of course I'm wondering what treasures await at the Depression Glass show this weekend since I've never been to one. Have any of you?